As a follow-up to last week's post where we considered the yawning gap in that Chainmail Man-to-Man Combat had no units of scale specified (and the years of headaches that followed), today let's try to compute what the distance scale should have been. Of course, more than one argument has been advanced in this direction. The most obvious one is to just take the figure scale in use and use the same or similar scale for ground distance; done. But here I'll take an approach I've never seen considered -- granted that Chainmail Man-to-Man Combat has no scale, it does have specified hit probabilities, and we can use those to back-calculate what distance scale is implied by those. A couple comments about this table: Internally, all the simulator really does is for each doubling of distance, shrink the apparent radius of the target by half -- and likewise to interpolate any other distance. Therefore, each doubling of distance is perfectly offset by a like doubling of the real target radius (and hence by a quadrupling of the number of men in formation), which can be seen by matching numbers running diagonally in the table. Of course, this presumes an immobile, defenseless, unarmored target (an aware and mobile man on the battlefield should shift these probabilities downwards by some amount). All of this is reasonable. For simplicity, we'll take the median missile range of 18 (as for a horsebow, light crossbow, or arquebus) as exemplary; therefore our supposed range categories fall at distance 6/12/18 inches, per the footnote on the table. Also note in the first column of results (armor class 1, which on this page indicates "no armor"), most of the hit targets are 5-6-7 (indicating the minimum score on 2d6 for a hit at each range category), with the outliers either up or down by one pip. 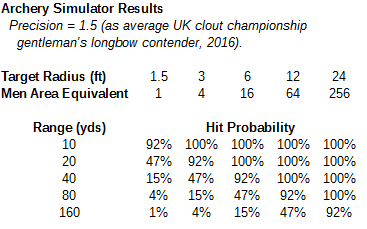 Now we'll take a few theoretical different scales for these "inches", see what the hit rates against a 1.5-foot radius target (one man) would look like according to ArcherySim, and convert those back to a 2d6 basis (for example, using a table like the one that appears at the bottom here). We will consider the possibilities that 1" = 10 yards, 1" = 10 feet, 1" = 5 feet, or 1" = 3 feet. 1" = 10 yards: Therefore the median missile range categories fall at 60, 120, and 180 yards. According to ArcherySim (using the detailed output option with the -L switch), the hit rates against the 1.5-foot target should be 7%-2%-1%. On the 2d6 basis, these percentages convert to target scores of 11-12-/ (i.e., effectively impossible at the longest distance). 1" = 10 feet: In this case, the range categories are 60-120-180 feet, equivalent to 20-40-60 yards. The simulator says the hit probabilities should be 47%-15%-7% (you can see two of these values in the topmost table, in the leftmost column). On 2d6 these convert to 8-10-11. 1" = 5 feet: Here the range classes are 30-60-90 feet, equal to 10-20-30 yards. ArcherySim estimates the hit rates at 92-47-24%. On 2d6 these become 4-7-9. 1" = 3 feet: Range categories become equivalent to 6-12-18 yards. Our simulator computes the chances to hit at 100%-83%-54%. On 2d6 that looks like 2-5-7. The first thing that is visibly obvious here is that the Chainmail modifiers for range adjustments, at just a single pip per category, are far too small. In the chart this appears as the Chainmail hit targets (the green line segment) being a tiny little span compared to the real-world models at around the same values. A better simulation would be to alter the hit targets by around 2 or 3 pips per range category (equivalent to something like −6 to hit in D&D with the d20 system). Also, this could be better if the range classes weren't assumed to be linear (that is: 6-12-24 range units would be a better physical model than 6-12-18 units; then the long-range chance segment wouldn't be shrunk compared to the medium-range chance segment in each case). The second only slightly less obvious fact is that the 1" = 10 yard and 1" = 10 feet scales (the ones actually used in D&D) are terribly poor matches; they don't even overlap the Chainmail 5-6-7 targets at all. The 1" = 3 feet proposal at least overlaps it, but is skewed off almost wholly to the left side (e.g., should be effectively unmissable at such a short range). The one that is best centered over then Chainmail hit interval is the 1" = 5 feet scale, and we can therefore use this as the true "implied" distance scale for Chainmail Man-to-Man Combat. Figure bases are necessarily broad in order to assure that the figures will stand in the proper position and not constantly be falling over. Because of this, it is usually necessary to use a ground scale twice that of the actual scale for HO, and squares of about 1 actual inch per side are suggested. Each ground scale inch can then be used to equal 3 1/2 linear feet, so a 10’ wide scale corridor is 3 actual inches in width and shown as 3 separate squares. This allows depiction of the typical array of three figures abreast, and also enables easy handling of such figures when they are moved. This is right in between the two scales that your graph suggests might be appropriate. I also like the fact that more of the ArcherySim probabilities fall below the Chainmail probabilities when you pick a scale with fewer than 5 feet per inch; it seems reasonable that an archer in man-to-man combat should have lower hit probabilities than the same archer shooting at a stationary target. In the same vein as archery, I think there's always been a big problem with shields in D&D. Non-magical shields provide too little benefit for a piece of equipment that was more-or-less indispensable until the advent of massed pole-arm formations. Magical pluses are even more problematic in how they raise the defensive capabilities of the shield from 1 to a maximum of 6 for a +5 shield. I was reminded of this issue by the talk of a target 1 yard in diameter being your approximation of man-sized, since a typical Viking round shield was almost that large! N.B. My DMG text actually suggests a board scale of 3⅓ (three and one-third) feet per inch (which I think is close enough to 3 feet for rounding purposes). You've got a fair point about support for the 3-foot scale with the ArcherySim model assuming a motionless target (and hence targets should be lower, probability to hit higher than in Chainmail). And I totally agree with the shield issue. It's a significant problem in classic D&D, and many times I wish I could change it if it wouldn't throw my stuff out of whack with other publications. Ah, you are correct about the 3 1/3, I was just misreading it because the print is so small in the fraction! By the way - 3 1/3 feet is 1.016 meters which makes for easy conversion to a grid of 1:1 for mapping and tactical tracking. I would try changing your use of 2x distance = 1/2 target width. I would consider the angle from one side of the target to the archer to the other side of the target and how that angle shrinks as the target recedes. It is easy to approximate with a right triangle with one leg being the target width and the other being the distance to target. The angle = arctangent(tar width/tar dist). This will give more rapidly changing attack rolls at shorter distances than for longer shots, which seems to make sense to me. Shots beyond X distance are all about the same up to the max range of the bow when prob goes to 0. Very much enjoying your balistics analysis, Delta; thank you! So as I understand it, the aim intention is to Adjust the range increments for missile weapons in Chnml with regards to the archery sim: the conclusion being (6” 12” 24”) (5’/ inch) ‘to hit’ #: 4-7-10, (92%, 47% 15%).... each range segment shifting by 3. How would you reconcile/integrate the motionless target of the sim vs moving target of Chnml? ‘The archery sim assum(es) a motionless target (hence targets should be lower, probability to hit higher than chainmail)’. Would you alter the unarmored Chnml scores of 4-7-10! to something like 6-9-12? Thanks for the kind words! Arguably it was an oversight on my part not to take account of the mobility difference above. Daniel Wakefield above makes a fair point that it leans towards 1" = 3' as a reasonable scale, given that. My rule-of-thumb is to give a +6 D&D to-hit if the target is immobile (30%). Given that, I could roughly guess that reasonable Chainmail to-hits might be 6-8-10 at 1" = 3' scale, or 7-10-12 at 1" = 5' scale. Maybe off by a pip or two. "Daniel Wakefield above makes a fair point that it leans towards 1" = 3' as a reasonable scale, given that." Perhaps, you might elaborate how the consideration of mobility clarifies the question of scale? That is, am I choosing 3 1/3' per man walking abreast because ‘three men” correspond with the standard dungeon corridor width? I see how you have assigned the numerical value (30%) for mobility and immobility. However, I don't recall how you arrived at '+6' for a stationary target, perhaps a previous post? It is interesting that in the DMG , stationary targets vs war machines receive a '+3'to be hit and in the AD&D PHB, large shields optionally receive '+2' vs. missiles and 50% cover delivers a +4 adj to AC. If we go with a 3 1/3 scale how do we order range segments w more powerful and longer range weapons like a longbow or heavy crossbow? Lastly, whatever scale is chosen is short range for hurled weapons considered long w regard to modifiers? Good questions. I'm sure that the 3 1/3' scale was suggested in the DMG because of Gygax's 3-men-abreast idea. As far as I'm concerned it's just another hypothesis for scale. In DMG p. 67 there's a list of modifiers for "melee combat or missile fore": +2 if off-balance, +4 if stunned/slowed, "Automatic" if totally immobile. I don't think that "automatic" ever makes sense for missile fire, so I'm making a raw guess that +6 (30%) matches the pattern and is reasonable. I certainly don't have a any good model to support that. I'm certainly a proponent that whatever the scale is, range increments should double at each step (i.e., apparent linear size of target consistently halves). So personally I use steps (in feet) of 30/60/120, etc. With the 3⅓ scale I could see (in feet) 20/40/80, etc. I'm not fond of automatically using the long-range modifiers for thrown weapons; I don't see any justification for that. 'I'm sure that the 3 1/3' scale was suggested in the DMG because of Gygax's 3-men-abreast idea'. That was my sense of it from Daniel Wakefield's post. 'As far as I'm concerned it's just another hypothesis for scale'. 'I'm making a raw guess that +6 (30%) matches the pattern and is reasonable'. I'm not sure this is reasonable. From Chainmail to the 3LBBs, Gygax retained the shield modifiers (1 pip) with the option of 2 pips vs. non-war engine missiles for a large shield (28 DMG). Further, the 'molecular vibrations' landing the displacer beast 3' (left, right, ahead or behind) subtracts 2 pips (10%) from their opponents attack dice (28 AD&D MM). Invisibility grants 20% or -4 pips. Hence, it seems to me a mobile target would most likely add no more than 1 pip vs. non-war engine ammunition. "I'm certainly a proponent that whatever the scale is, range increments should double at each step (i.e., apparent linear size of target consistently halves)". This is very helpful, yes. "Personally I use steps (in feet) of 30/60/120, etc. With the 3⅓ scale I could see (in feet) 20/40/80, etc". Right the 6 12 24 scale. I suggested the 3 1/3' per inch as a potential figure for what Gary Gygax might have thought was a reasonable scale in his head, before he muddled everything up when typing out the actual rules with the disastrous "10 feet indoors, 10 yards outdoors" nonsense. The idea of favoring a 3' scale over a 5' scale is that the 3' scale is the only one where it is the simulated archers in Delta's ArcherySim have better chances to hit than provided for in the Chainmail "to-hit" numbers. The idea is that the simulated archers, who are shooting at immobile targets, should hit more often than Chainmail archers who are shooting at mobile humans (or orcs or whatever) who are presumably doing their best not to die. As for the modifiers, see our brief discussion of shields above, as well as Delta's previous posts about range modifiers; there's a fair bit of evidence that many of the modifiers by-the-book are too small. Having caught some errors in my response and reconsidered some of the comments herein I just wanted to again say, thanks. As noted previously it is a clever connection to link the 'three men may walk abreast" party order in a dungeon corridor with scale as a whole. The only concern I have with using the 3 1/3' / inch scale is the loss of range, but alas one must choose a limit for each range category (s m l). The modifiers in a 2d6 distribution, be they interpolated from Chainmail's 'Individual Fire Missile' table, the MTM rulings or back-ported from the 3LBBs appear to me to be rather substantial. As I noted above in my response to Delta, the shield adj of 1 pip vs. melee weapons and 2 pips vs. missile weapons on a 2d6 is significant. These values and others I submitted from the Monster Manual put a mobile target in perspective when applying the sim to a 2d6 probability spread. Whether one is citing a shield modifier or even a rear attack, 1 pip on a 2d6 seems reasonable, as would 1 pip for a mobile character. At this rate, I think one might even entertain applying 0/-2/-5 range modifiers from AD&D to the 3' and 5' scales alike; these modifiers being an approximation of the aggregate modifiers for distance and movement in a 2d6 spread. So I think there's a bit of "talking past each other" going on. When Delta talks about something like a +6 for missile fire at an immobile target, he's talking about on a d20. When I mentioned a shield only adjusting AC by 1 point being too little, I was talking about attack rolls using a d20. Our criticisms stem in part from the fact that many modifiers in D&D were brought over unchanged (or at least, insufficiently changed) from the modifiers used in Chainmail, and in part from the fact that missile ranges are far too long for man-to-man combat, with the given ranges being appropriate only if shooting at the broad side of a barn. "When Delta talks about something like a +6 for missile fire at an immobile target, he's talking about on a d20." I think that was clear. I asked Delta for an official source from which he might have derived such a modifier. He stated, " I'm making a raw guess that +6 (30%) matches the pattern and is reasonable. I certainly don't have a any good model to support that". "When I mentioned a shield only adjusting AC by 1 point being too little, I was talking about attack rolls using a d20". This I understood as well. Within the context of modifiers specific to d20 a shield's melee adjustment of 1 pip vs. melee or 2 pips vs. missile weapons (28 DMG) seems well-fitted; compare adjustment for flanked, prone, invisible etc.. Further hit points as I am sure you already know reflect the effectiveness of a shield in the d20 spread. "Our criticisms stem in part from the fact that many modifiers in D&D were brought over unchanged (or at least, insufficiently changed) from the modifiers used in Chainmail"
It's a fair criticism to level that perhaps the Chainmail modifiers were not adequately adjusted to meet a wider probability distribution. However, the d20 spread as I have come to understand it was to err on the side of story book characters and fantasy rather than the grit and naturalism assumed in Chainmail's non-heroic M-T-M. A wider distribution spread and a d6 for hits (hit points) was a design choice. "and in part from the fact that missile ranges are far too long for man-to-man combat, with the given ranges being appropriate only if shooting at the broad side of a barn"
To that, both of you have presented some compelling work framing the subject quite elegantly. As the OP dealt with the 2d6 spread of Chainmail and missile weapons therein, one that I use myself, I have tried to restrict my comments its use. "Further hit points as I am sure you already know reflect the effectiveness of a shield in the d20 spread." Hit points reflect skill at fighting and make you harder to take down in general, but they're more or less orthogonal to the issue of shield bonuses - a fighter gets the same number of hit points whether he's using a shield or not. "However, the d20 spread as I have come to understand it was to err on the side of story book characters and fantasy rather than the grit and naturalism assumed in Chainmail's non-heroic M-T-M."
I see it as the opposite - with smart play, it should be the PCs who are benefiting from these modifiers most of the time. Most of the common monsters have below-average intelligence compared to humans, and that's not even counting the plethora of beasts, oozes, plant monsters, etc. with even less power of reasoning. It also fits well with mythological and fantasy characters, who often use their superior intelligence to secure advantages against stronger foes. For example, Sigurd slew the dragon Fafnir by digging ditches along the path the stream where the dragon went to drink, which protected him from the poisonous vapor the dragon constantly exhaled and allowed him to strike at the dragon by surprise from below. A scrupulous reading of D&D would give him at most a +2 bonus on his attack, but I think somewhere in the neighborhood of +5 would do the legend a lot more justice. Valuable observations guys, thank you! I think the motion modifier should get larger at longer ranges. Perhaps just double the range penalty for a moving target. Motion at 10' is not going to make much difference. At 200 yards, it would next to impossible to hit a moving target. You could even do the same thing for shield and if target is aware of the shooter. Motion is times 2, motion with awareness of being a target times 3. Shield would be times 4, but then again I'm not sure the shield gets any better at range. That one I'm not sure about. Arguably the parallax for motion at 10' is greater (requires more tracking movement) than at long range. I do agree that a shot at 200 yards is next to impossible to hit... and true even for an immobile target. I’m not sure the amount of parallax is the issue. If you are off by a degree of arc at 10’ you will still hit; at 200 yards you will not (which is why the to-hit mod is higher at longer ranges). If you shoot me at 10’, and you manage to shoot where I’m at, the amount of motion before I’m struck by the arrow will not make much difference. At 200 yards, I will have moved several entire body lengths. The motion at short range has much less effect, because there is much less motion before the arrow strikes. I find it interesting that two parallel publications to Chainmail and D&D, Boot Hill and Warriors of Mars specify a 1:1 scale of 1" = 6 feet and 1 turn = 10 seconds. Warriors of Mars is of especial interest, since in many respects it fleshes out the Chainmail rules to some extent, and has some interesting thoughts that could impact D&D. For example, levels of ability are introduced, with 13 being the maximum. There is a significantly expanded "Animals vs. Men" table that is based on the table in the Fantasy section of Chainmail. There are also some rules for the use of levels in Man to Man combat that could be used to cross Chainmail and OD&D. All very interesting stuff. That's a great observation, and possibly I should weave it into these kind of posts more often. I don't have Warriors of Mars, but I do have Boot Hill, of course. There's so many different angles suggesting that's really the proper scale.